Fly Like A Bird ! Ever since man first looked up at the sky, he was yearned to glide and soar like an eagle in the sky. Parasailing and Paragliding are indeed, experiences that combine the wonder of smooth sailing in the air and the thrill of soaring high above the ground. Once in the air, one may experience the ethereal serenity of the sport. It is an experience that is surprisingly, thrilling as well as becalming. Para gliding uses “thermals’ as the driving force, and is the closest one can get, to being a bird. In perfect weather conditions one can stay aloft for over three hours and can soar to heights more than 3,000m. Nepal forms a rectangle on the southern slopes of the Himalaya and is without exception, the most stunning country imaginable. 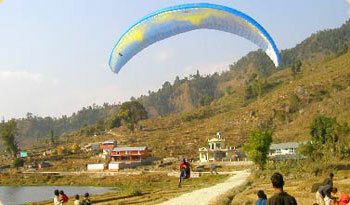 The main area for paragliding is the Pokhara valley, commanding views of 3 of the worlds 8000m peaks with friendly and constant conditions for your paragliding holiday. Tandem flying involves a pilot flying with a passenger. Both have separate harnesses that are attached to each other and the wing. Paragliding harnesses are built for comfort and safety, they feel more like an armchair. Once launched the passenger just sits back, relaxes and takes in the epic scenery. Even taking pictures is not a problem. Due to the portable nature and easy launch characteristics of a paraglider (they fit into a rucksack) We can take them anywhere and fly them from most mountains in Nepal. In the morning and late afternoon these 15min flights give you a taste of unpowered flight, taking you over Pokhara lake and then landing by a Lakeside bar. This midday flight gives you the thrill of high flight as we thermal up above Sarangkot in the company of eagles and vultures, 30min – 1 hour. We land by the lake.